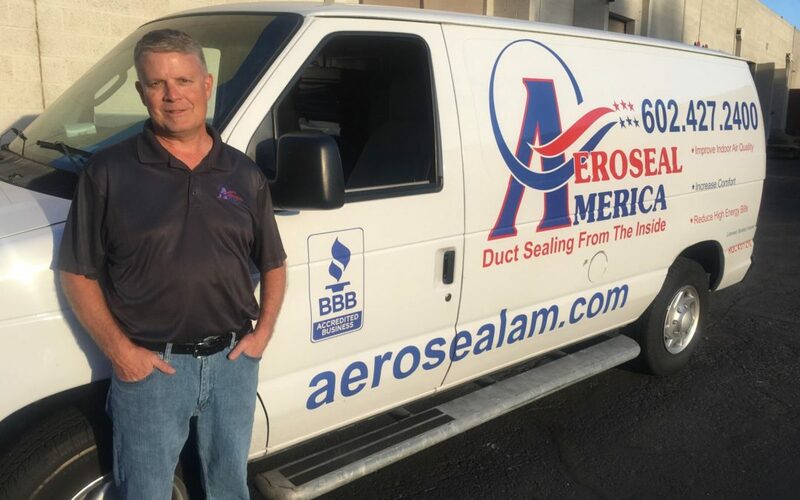 PHOENIX, Ariz. (March 26, 2019) – Aeroseal America, which has provided a patented technology to seal ductwork for the residential housing industry for 3 years, has launched a commercial component to service a new line of clientele. Aeroseal America’s new service line will provide testing and sealing of ductwork for HVAC systems in light commercial properties. Aeroseal America’s technology involves sealing ductwork from the inside. Leading the company is Pat Farrell, whose experience includes owning and operating an energy assessment company, Power Down America. He founded it in 2009 after making improvements to his own home and realizing the immediate impact in comfort and savings. “I quickly realized that duct leakage is a major problem in the Arizona housing market,” Farrell said. “The conventional way to seal duct systems is to have someone crawl through the attic, which can run 150-plus degrees during the summer, and seal all of the joints and connections with a paste called mastic. “Because of space restrictions, ducts running through soffits, and flat roofs with no attic access, reaching all of those joints and connections can be impossible. Aeroseal solves that problem,” Farrell said. Farrell said he was offering Aeroseal to his customers and using other contractors for the work. He was not pleased with the quality of work or the level of customer service so he made the decision to invest the time and money to acquire the training and equipment necessary to provide Aeroseal to his residential clients. He is eager to begin offering this service line to commercial clients. For more information, visit www.aerosealam.com.